PennsylvAsia: 2018 Hanami (花見) with Pittsburgh Sakura Project, April 22 at North Park. 2018 Hanami (花見) with Pittsburgh Sakura Project, April 22 at North Park. Photo by Kazuko Macher, who placed second in the 2013 Photo Contest. 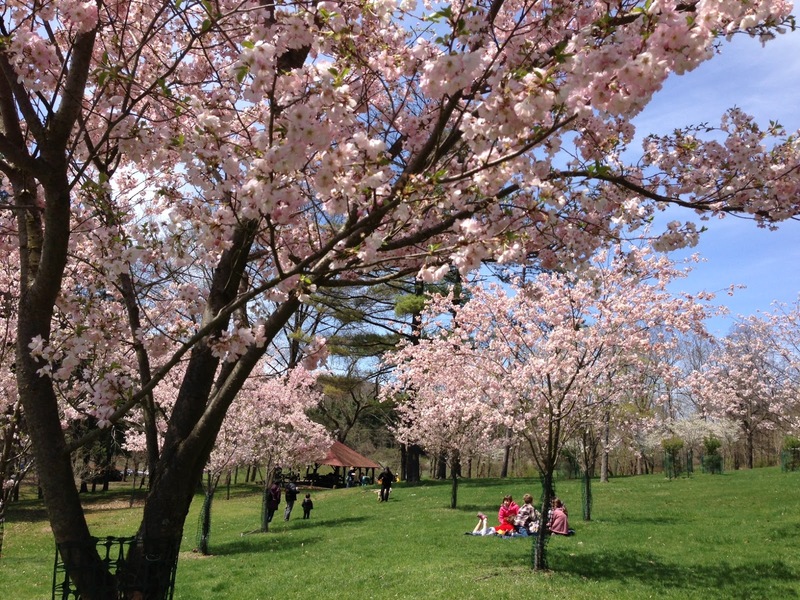 The Pittsburgh Sakura Project will host its annual hanami (花見, cherry blossom viewing) on April 22. Come enjoy the Pittsburgh Sakura Project cherry blossoms in North Park. Meet near the Boathouse, receive a map of the planting area, take a self-guided tour, and have light refreshments. Meet other people who love cherry blossoms. Take photos (you can submit them to the 2018 Pittsburgh Sakura Project North Park Cherry Blossoms Photo Contest). The event runs from 2:00 to 4:00 pm near the North Park Boathouse (map). Those interested in light refreshments should RSVP to teruko @ andrew.cmu.edu. The Pittsburgh Sakura Project was founded in 2007, and began planting cherry blossom trees in North Park two years later. The Pittsburgh Sakura Project (PSP) began in 2007, with a proposal by members of the Japanese Association of Greater Pittsburgh and approval by JAGP’s Board of Directors. The PSP became an independent nonprofit organization in November, 2009. We plan to plant 250 ornamental cherry trees around the greater Pittsburgh region over a 10-year period, in honor of the 250th anniversary of the founding of Pittsburgh in 1758. Our aim is for lovers of cherry blossoms to enjoy beautiful, mature cherry trees in the Pittsburgh region. The PSP will enable visitors to Allegheny County parks to enjoy the unique scenery of Sakura and strengthen bonds within the local Japanese community by creating a focal point for cultural and personal exchange. By adding the new element of Sakura to existing park scenery, we create a new aesthetic while preserving the woodland scenery, an example of cultural harmony and environmental sustainability for future generations.